Okay I admit to being a bit of a gin-lover so there was no way I was going to be able to resist a book with this title! 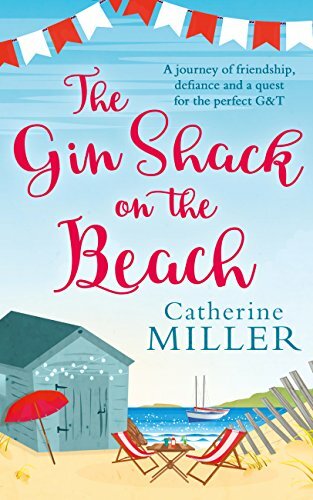 The star of the show in this book is Olive Turner, a lady in her eighties who loves nothing more than spending time at her beach hut, testing out various combinations of gin and tonic in search of the perfect blend and she’s not averse to a bit skinny-dipping either! After a couple of incidents at home, she agrees to move to a retirement home Oakley West. This seems an attractive prospect as someone else will be cooking and cleaning and Olive will have more to enjoy life, However, it doesn’t quite work out like that and soon Olive is planning ways to escape to her beloved beach hut with a few of the other residents. I loved the character of Olive. From the very first paragraph she was doing and saying things that made me laugh out loud. She is exactly the kind of old lady I would hope to be: “these days she didn’t get two hoots what anyone thought…..The only person she planned to please these days was Olive Turner.” A perfect philosophy for life and possibly one that should be adopted before reaching old age. She was an intelligent woman who didn’t see why she should stop doing the things she loved based on a little thing like age! From quite early on, it became apparent that there had been some event in Olive’s life which had caused great sadness and had certainly affected her relationship with her son Richard. I wasn’t keen on Richard at first as he seemed determined that he knew what was best for his mum and didn’t listen to Olive’s opinions at all. As the story went on, the reader begins to guess at what has happened in the past and why the mother and son don’t get on as well as they might. The two become closer when they begin to talk about what has happened. The Gin Shack on the Beach is a warm and funny book about friendship, growing old disgracefully and gin! Perfect summer reading, or for anytime really when you want a feel-good and uplifting read. Now I’m off to have G&T – cheers! Thanks to the publisher, HQ Digital, for my copy of the book via Netgalley. The Gin Shack on the Beach is published today as an e-book and you can order a copy online by clicking here.